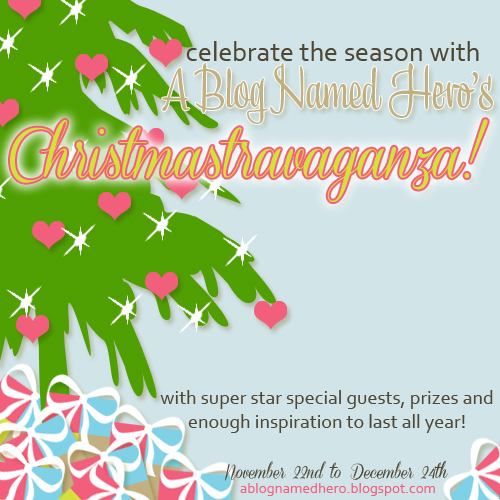 Christmas-travaganza Day 5: Make it Merrier! Cheiron here with some Christmas-travaganza fun for you! There’s no doubt that I love receiving a beautiful card in the mail any time of the year. When sending out cards, I like to make sure the envelopes are as much fun as the cards that are inside them. This is especially fun to do at Christmas time, it just makes everything merrier! Today, I thought I would share some of the ways I planned to decorate my envies this year. Why not add a little surprise to the inside of your envie? This Hero Arts envelope liner template makes it fun and easy! I used the snowflake stamps on kraft to make my own patterned liner. If you are not planning to mail the card, and will giving out holiday cards with gift cards inside, it is always fun to personalize the envie with the recipient’s name and a fun image. I made a bunch of these for the folks at doggie day care who take great care of our pup all year long. GIVEAWAY!!!!! Follow the Rafflecopter directions (below) to enter the giveaway. If you leave a comment on this post you will receive ONE entry to win a some fantastic prizes we have up for grabs, BUT…If you comment every day during the extravaganza you will have a total of 31 chances to win prizes!!!!! Check out Rafflecopter on how to earn even MORE entries!!! You have until December 31st MIDNIGHT EDT to leave your comments. Winners will be announced on January 3rd. Make sure to check back all month for even more fun Christmas ideas! Its a great idea Cheiron, I will surely try them on my envelopes.. Superb idea!!! Perfect way to add that nice touch to a hand made card. love the names on the envies!! 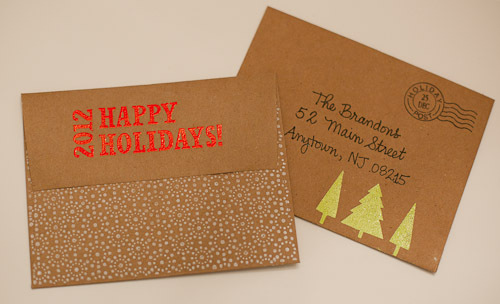 How FESTIVE with the stamped envelope! Love the envelope liner…I never remember to do that! And I just ordered my neon inks!!! Can't wait to get them! Great ideas! I never think of decorating the envelope. Love that personalized envelope! I need to try that. Thanks for the inspiration. Great idea Cheiron! I'm sure the Postman loves to see a lovely stamped envelope instead of the normal plain ones! these are so pretty and i love the little touches on the envelopes! I love a good looking envelope… it increases the anticipation of what is inside. I love the stamping inside the envelope! So much fun! Love the envie all decorated for the holidays. Thanks for the inspiration! This makes receiving a hand made card even more special! Beautifully done, Cheiron! I love the Snow Dots stamp! Love that you decorate your envelopes! I love decorating envelopes, too! It is worth the extra bit of time it takes to make them stand out. Cheiron! This is just perfection!!! Totally love the stamp choices!!! Lovely envelope ideas! Makes a card special, more like a gift package. Such a great idea Cheiron, makes opening a card just a little more special!! Very cute ways to decorate envelopes! How do I get on your Christmas card list? Ha-ha, these are beautiful. I didn't make my cards this year (too many of them made the process overwhelming), but I think maybe I'll try to jazz up the envelopes just to put my crafty touch on things. Thanks for the idea! Beautiful work! What a simple little way to let someone know how truly special they are!! Love your ideas!! It's so festive and fun to decorate the envelope as well as the card. That envelope is fantastic! Love it! Great ideas, Cheiron – the envelopes make the cards even more special! love the personalised patterned inside the envie….awesome! Wonderful idea for your envolopes! Loving the stamping on the back of the envelope! I wouldn't have thought of that! Lovely idea, it adds a special touch to the envelopes! Especially like the little ornament cards! So cute! I love decorating my envelopes too! I tried the rafflecopter. I am not sure if I did it right. Oh well. Ah, this is great, Cheiron – all these added touches to make someone feel so special! I don't usually take the time – thanks for the inspiration. Taking care of Big Boy is a real honor, I bet. Hugs. I never think to decorate my envelops. I must try it. Love the stamps on the inside of the envelope. I always try to decorate my envies! Beautiful!! love the envelope liner. Great idea! I love to add something to my envelopes. Decorated envelopes just seem to add that special finishing touch! Love it! super fun! I love how you decorated the envies! I agree, Cheiron! I love seeting a decorated envelope in my mailbox. Love your pretty design! Love your decorated envelope. It's very elegant ! Great ideas, love the personalized! Love the personalised envie liner! 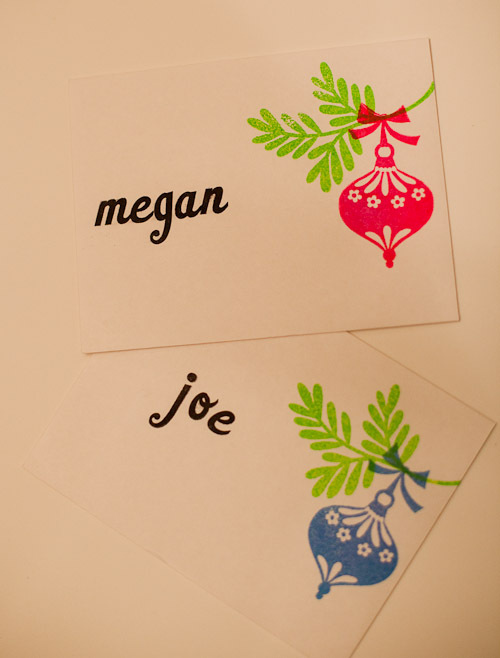 LOVE these…I never do my Envelopes but for my Christmas cards this year I did! It does make them look so much Better! Love your decorated envelopes, Cheiron! It really does make a difference if you take a few seconds to make your cards stand out! Great ideas! Gorgeous envelopes!! Love these fabulous ideas! I usually decorate my envelopes too, especially at Christmas! Great ideas! Thanks for the chance. Keepsake cards + keepsake envelopes – just makes BEAUTIFUL sense! Thank you for sharing and inspiring. I love those white envelopes stamped with all that color! great idea. I love your envelopes! What a perfect match to a handmade card. I never have decorated my envelopes but I sure do think they add the finishing touch! Great idea to decorate the envelopes; love the Kraft look to the liner. That is a super idea to decorate the envelopes too. White always looks good on the kraft! I never think o stamp the inside, what a great idea! The matching envelope is perfect! I rarely decorate my envelopes… mmmmm.. maybe I should. Thanks for the inspiration! These are so cute! I love how you did the inside of the envelope! Lovely ideas to cheer up an envelope, Cheiron! Thanks for sharing. So sweet of you to make the cards for the doggie-care-people! Beautiful. Have to try this. The matching envelope is perfect! Love it! Beautiful envelopes and cards Cheiron! Thanks for the reminder to decorate the envelopes too! Love the inside of the envie – all those snowflakes, so pretty! Great idea! I always forget about the envelope! Like the design of card as well as the envelope decorating. Love lining envelopes. The decorated envelopes are wonderful! Kraft and white is so popular right now. I'm going to try a project like this. I like putting a coordinating stamp on an envelope too – one of those things I used to do but seem to have let slip. Thanks for the reminder. I love how simple it is to add a beautiful element to the envelope. The liners are terrific! What a cool idea to stamp the inside of the envelope flap. I will have to try that too! so cute. love that you decorated your envelope too. 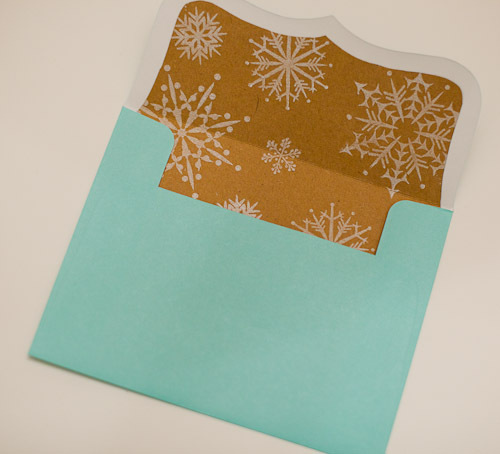 Love the snowflake envelope liner! Such fun ideas. Love the envelope liner!